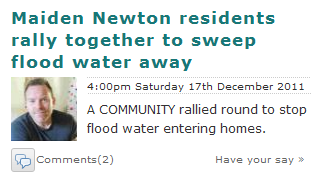 "[Maiden Newton] rallied round to stop flood water entering homes. "As heavy rain storms battered Dorset, drains at Whitehall in Maiden Newton blocked and couldn’t deal with the deluge. "Residents noticed the water start to rise on Thursday evening and the whole street mucked in thorough the rain and wind, using brushes to sweep the water away."